Al Khulifah Group of Companies was founded in Kuwait in 1977 by Dr. Bader Al Khulifah. The company grew and established itself under his eminent leadership, and was strongly supported by experienced management teams, high operational standards and sophisticated infrastructure. Dr. Bader Al Khulifah’s vision and determination saw the Al Khulifah Group diversifying its wings to all major segments in the State of Kuwait. Since inception, the company has built its business model by maintaining long term relationship with the clients and partners. We believe and understand that great service and living up to the promises was critical to our business, and we hold on to those values till date. Foresight, energy and a passion to be the best, drive us to explore new opportunities and to build strong and effective business partnerships on trust, integrity and mutual benefit. Highly trusted and well recognized for our commitment to quality, Al Khulifah Group prides itself at being one of the most preferred business entities in Kuwait. We are competent and reliable in various fields where we had been recognized both nationally as well as internationally. With unparalleled regional expertise and marketing knowledge, the Al Khulifah Group’s dynamic performance has been driven by continuous investment in talent, infrastructure, operational excellence, and by our ambition to be the best in the region. Through a spirit of trust, co-operation and best practice, we continue to build long-lasting, professional and mutually profitable business partnerships. The breadth of our portfolio, our understanding of business and consumer needs, and our ability to deliver integrated development plans at pace, makes us the business partner of choice. Al Khulifah Group is an organization committed to its employees, customers, owners and community. We are result-oriented and customer focused company, committed to satisfy our stakeholders by providing productive environment through team work, culture and open communication methods. This profit results from ethical activities that honor the fundamental principles and values of the company. The key point that distinguishes our company from our competitors is the integrity of profit making and the related resource allocation practices by the management and its owners. We are always committed to a mutually beneficial business relationship with the community, creditors, vendors, suppliers, distributors and respected competitors. Our group fully believes in a win-win partnership that enhances the quality of the products and services while building trusting relationship that will lead to greater customer confidence and loyalty. We keep our employees committed; we delight our customers, satisfy our stakeholders and create a partnership environment with supplier and creditors who are glad to be our business associates. Al Khulifah Group of Companies was formed by building personal relationships that have enabled the company to become a trusted and capable player within the international market, representing over 11 companies. We are known within Oil field and Security Sector as a discrete and reliable company that can now boast relationships and provision of services with major international companies and groups. It is now time to take this well-earned position forward and expand exponentially so that Al Khulifah Group can continue to keep it promises and provide the services which will see it continue to develop and grow. Through our Consultancy Division, Arabian Scientific Consultancy Center [ASCC], we successfully steared an Environmental Project for KOC called “Management of the Spirit of the Desert” at Burgan Oil field – LVC.NO:06L127, KOC in the year 2006. Environmental Project called “Rehabilitation of the Spirit of Desert – LVC No.06L-212. 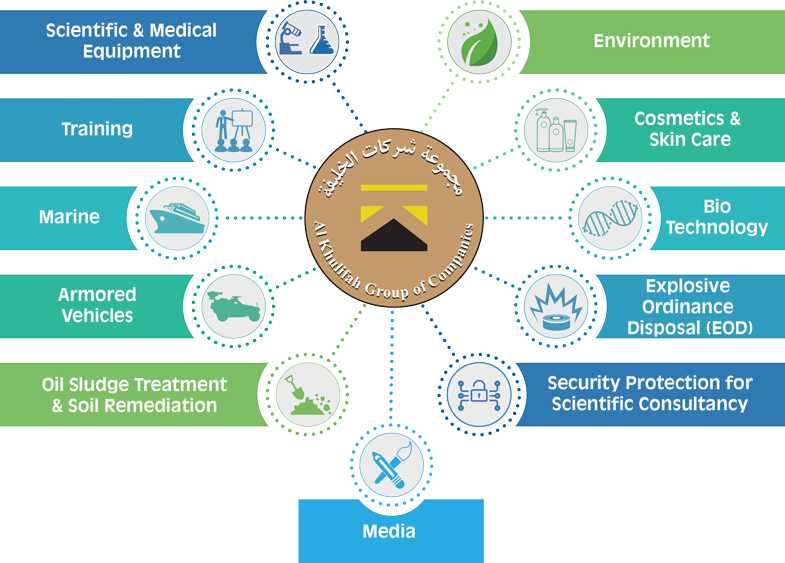 [Sustainable Management of Fragile – Sensitive Ecosystem in the Spirit of the Desert]. Burgan Oil Field – KOC, in the year 2007. Pilot Project for KOC called “Protection of WK Pipelines against shifting Sands – LVC.071279” through our Consultancy Division [Arabian Scientific Consultancy Center (ASCC)].. Soil Remediation Project with KOC. Supply of HSE Devices with manpower to KOC. Supply and maintenance of FOUR Surveillance Ships to the Kuwait Coast Guard.